Honolulu is on the island of Oahu in Hawaii. It's the capital and largest city in the state and is the center for government, transportation, and commerce. 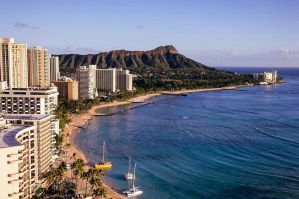 The city has a population of about one million people in the greater metropolitan area and it is where you'll find one of Hawaii's most famous tourist destinations, Waikiki Beach. Most visitors who come to Hawaii enter through Honolulu. It's an energetic and lively city with a lot to see and do. It's definitely not an off-the-beaten-path location, but it is a great place to spend some time. Peak season in Hawaii is usually when the weather is at its worst on the mainland. High season is from mid-December through March, and during these times reservations should be made well in advance. Hawaii is not a cheap destination and this is particularly true during peak season. If you're on a tight budget, hostels are likely the most affordable option for you. 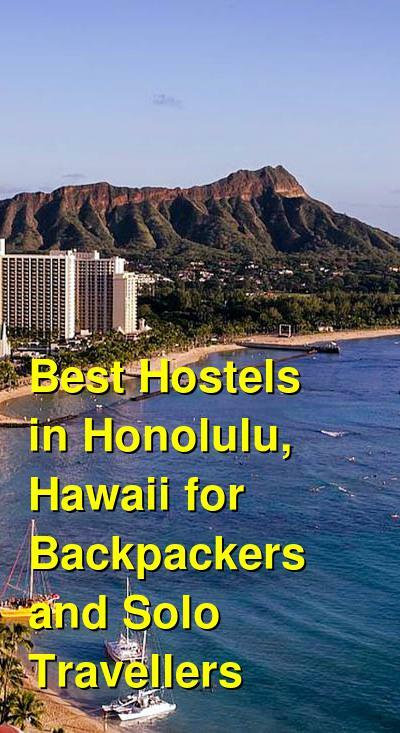 There are some good hostels around the Waikiki area that appeal to budget travelers and backpackers. How much do hostels in Honolulu cost? A good hostel for solo travellers, couples, small groups, and students. HI Honolulu is a favorite hostel for budget travelers to Honolulu. It's located about two blocks from Waikiki Beach and is just one block from major bus lines. It's part of the Hosteling International network and it is a clean and reliable place to stay. This hostel appeals to all types of travelers including students, backpackers, and solo travelers. If you've come to Hawaii for a party, this is probably not your best option, but it is a comfortable and relaxed place to stay at a good price. If you want to enjoy the beautiful outdoor setting you can borrow boogie boards, snorkel equipment, and beach mats from the hostel. There are also guidebooks available if you want to plan the next day of your trip. The hostel offers free wi-fi throughout, laundry facilities, and parking for $5 a day. As part of the Hostelling International network, non members will be charged an additional $3 fee per night. The fee will be collected when you check in. The hostel has private twin, double, and four bed rooms available. There are also six bed dorms that are split by gender. A good hostel for solo travellers, small groups, and backpackers. Seaside Hawaiian is one of the longest running hostels in Waikiki. It's conveniently located about two blocks from the beach and is just a short walk from many shops and restaurants. It's right in the heart of Waikiki and is near many good surfing spots as well as nightlife. The hostel is a great place to relax and there are hammocks hung throughout. There's a nice courtyard with banyan trees that offer shade. You'll feel like you've discovered a secluded retreat in the heart of the city. The hostel has all kinds of equipment available that guests can borrow. There are boogie boards, snorkel gear, and beach mats. There's also wi-fi in all of the rooms as well as the courtyard. In total, the hostel has eight dorm rooms that sleep either four or six people. Security lockers are available in most rooms. There are also private rooms available that use shared bathrooms. Luggage storage and laundry facilities are available as well. This is a fun and relaxed place to stay where it's easy to meet other guests. It's convenient location and affordable price make it an excellent option for budget travelers. A good hostel for backpackers, solo travellers, and couples. The Beach Waikiki Boutique Hostel is a recently renovated hostel that is affordable and fun. They offer all kinds of activities for guests including free barbecue nights and free pizza nights. Most of the events are hosted on the rooftop lounge, which is a fun place to hang out and meet other travelers. Guests can also enjoy use of the hostel's bicycles, surfboards, and snorkeling equipment. Most items must be rented for a small fee. Parking is also available for an additional $10 a night and airport drop off is available for $15 a person. This hostel is conveniently located right in the heart of Waikiki. It's about half a block from Waikiki Beach and is not far from the area's best shops, restaurants and surfing spots. It's also just a short drive from more off the beaten path locations such as waterfalls, hiking trails, and nice beaches. This hostel has twin, double, and three bed dorms available. There are also four and six bed dorms that are either female only or co-ed. This is a good place to stay if you're looking for affordability in a convenient location.